Last weekend J and I hit up Antiques in the Garden at one of my favorite nurseries, Petals from the Past. While we were there I stumbled upon an old worn out ladder with round rungs. I’ve been looking for a ladder with round rungs ever since I spotted the ones in Pottery barn hanging over the tables and used as lantern hangers. How freaking awesome is this?? So, I asked for the booth owner to give me a good deal on all three items, and he agreed! I love bargaining for stuff. It makes me feel like a Pawn Star. We loaded everything up along with a few other treasures and brought them all home. J got to work hanging the ladder over our patio table so we could have some lantern action of our own this summer! I’m so happy with the way this project came together. A huge thank you to my husband for helping me with this. I can’t stop oohing and aahing over it. 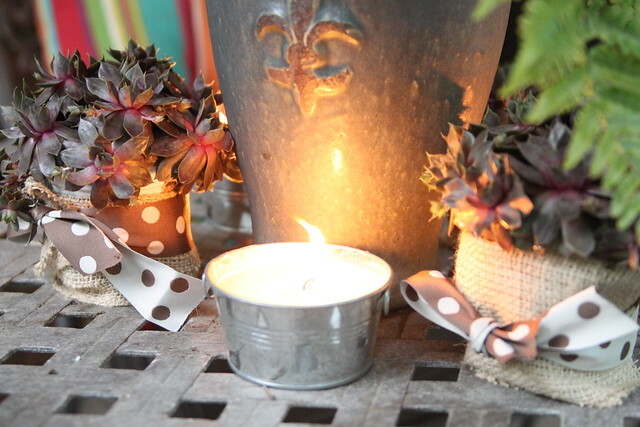 To create the centerpiece, I folded lengths of burlap and wrapped them around store-bought containers of succulents. Polka-dot ribbon tied in a simple bow holds the burlap in place and adds a pretty feminine touch. 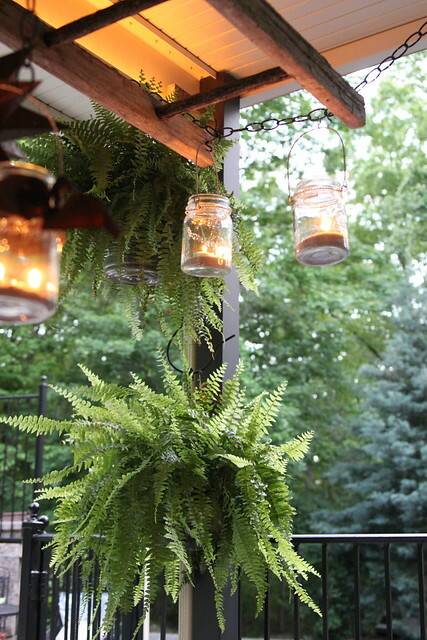 Citronella candles in mini galvanized buckets helps to keep the mosquitoes at bay, while an Autumn Fern spills over the top of a fleur-de-lis planter. Even my ferns seem happier peeking out behind all this awesomeness. 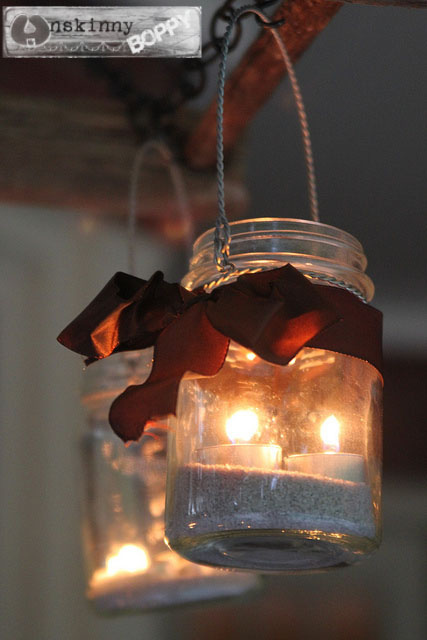 The hanging lanterns came from Kirkland’s, although I’m sure you could DIY these pretty easily. I added the ribbon and the sand stuff at the bottom. 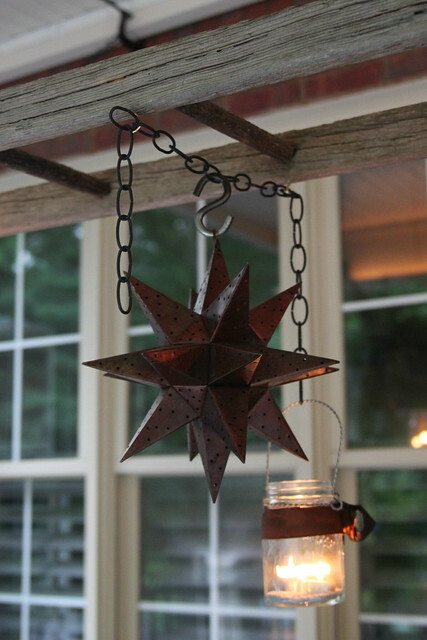 I’ve had that Moravian star from Pier One since our wedding back in 2004. It gets around. 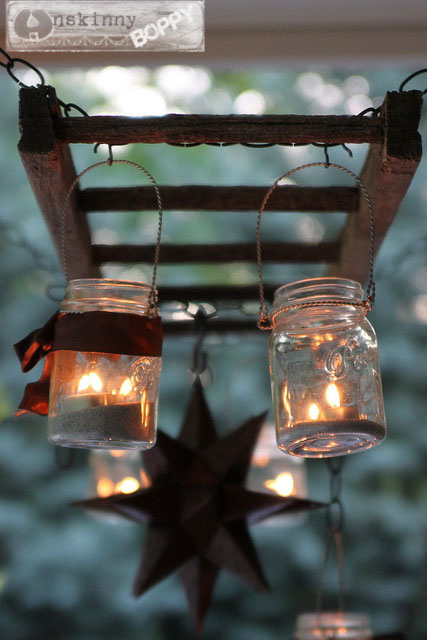 Altogether between the ladder, the mason jars and the star lantern I think I might have formed a trifecta of perfection. Now here’s more about how we did it, in case you’re wondering. 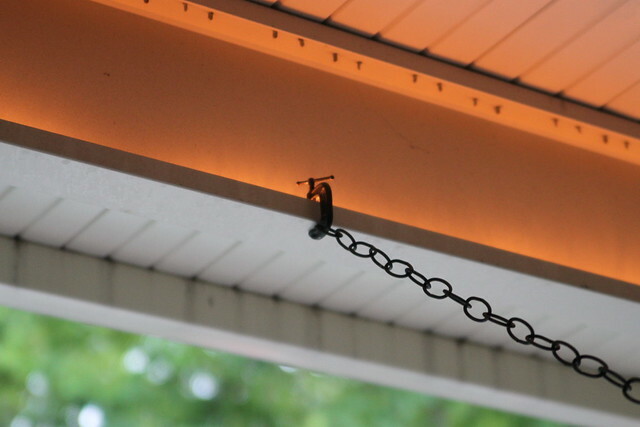 To attach the chains without drilling into our patio roof my husband used “C” clamps. As a side note, let me say that he also put up our rope lights from our old patio so the ceiling is lit up at night. I love soft, ambient, glowy patio lighting at night. He used “S” hooks and regular hooks with a screw at the end to attach the lanterns and the chain. It is pretty sturdy, but I have switched most of them over to these carabiner keychains for a much safer connection. will take the glass lanterns down when they are not in use in case a freak storm blows through. I don’t want to risk broken glass all over our pool patio. Isn’t is so pretty? I just love it. It’s going to get a lot of use this summer with the pool light turned on and the tree frogs and crickets chirping outside. I’m falling deeper in love with this house more and more every day. Garrett was obsessed with blowing out the candles. I think I might have a little pyro on my hands. Yikes. He also asked to pose with the new “campfire” so I happily obliged. What a rare event for him to willingly pose in front of the camera like this! Snap snap snap! The view from my lounge chair is even more excellent than before. Anyone want to come over and have a night time picnic with us? I’ll fill up the cooler and light the grill. BYOMR. (Bring Your Own Mosquito Repellent). I am absolutely in love with all your awesome finds–and what you did with that great ladder/the lanterns is just FANTASTIC!!!!! i definitely want to try this, too!!! You have inspired me!!!! Wowowowow I love this idea. It looks amazing, you always make everything look so easy and effortless!! Nice project and post.Thank you for sharing your inspiration. Now, this is really sweet…love this idea! Just in time for summer entertaining ! Thank you for sharing the fun post full of inspiration ! Now THAT is creative! SO pretty too. Did you buy the haning jars recently at Kirkland’s? ‘Cause if you did, I’m running over to get some for myself so I can copy you. This is flippin’ awesome. Looks like something out of a catalog. My aunt used to always have an old ladder on her front porch to hang potted plants. She was ahead of her time, huh? I just discovered your blog and I am in love with this project. I adore the Moravian Star. Love this ladder idea and your porch looks so pretty! Love, love, love this! Your version is much better than Pottery Barn! Your lantern is amazing! 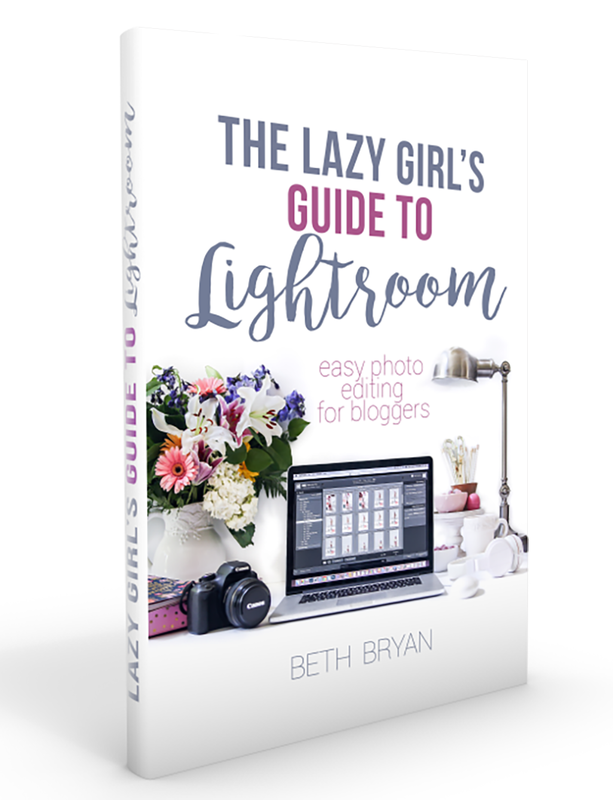 Really appreciate you sharing this great post with us at the Creative Bloggers’ Party & Hop. love, love, love, this idea – I am thinking of my own spin on this. I have access to wood pallets and am thinking of using half a pallet to recreate this idea. Thank you so much for sharing – you have inspired me and several of my friends. Wow – this is one of the BEST projects I’ve seen in a long time!! So clever, creative, and charming! Gorgeous. I am so jealous! Seriously. We don’t have any kind of overhang on on patio or I’d be all over this. Love it! and everything else you do! What a fantastic idea, I absolutely love this! 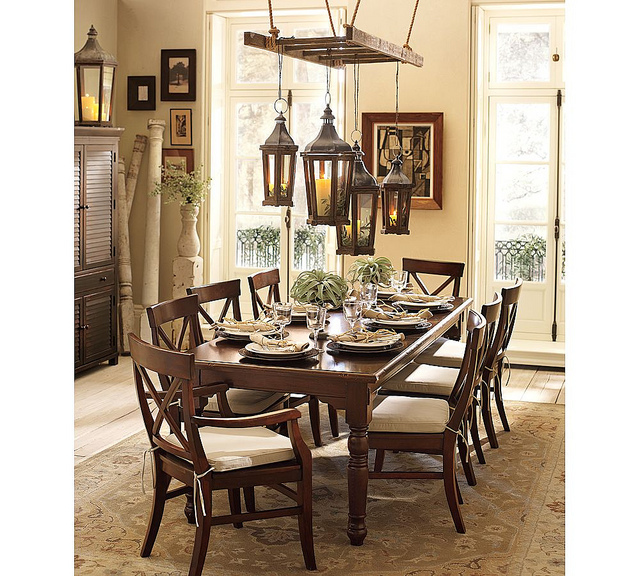 Love your lantern ladder chandelier! Looks great out on your patio! 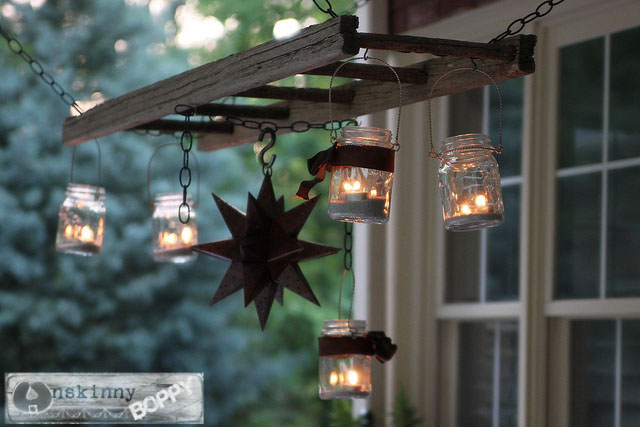 Just beautiful Beth, I love this idea, what an enchanting porch you have! Thanks for linking up to the party ! This is wonderful~ I love your inspirations and how you made your own charming piece! Stopping by from CG today~ I host a Friday decorating party if you would like to come join sometime- love this! Love this! Thanks so much for sharing such a fun idea! oh my goodness…BEAUTIFUL! I want to come to your house!!! this is absolutely gorgeous! Love yours much more than the PB version. 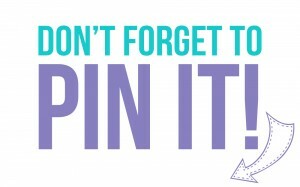 I would just love it you’d find a moment to share this on my international crafty linking party, Craft Schooling Sunday, we could really use someone like you at the party! all the best and hope to see you there, and of course please feel free to share a few projects! Hi Beth, this is a fabulous find! I love how you made the ladder fit in with your decor. 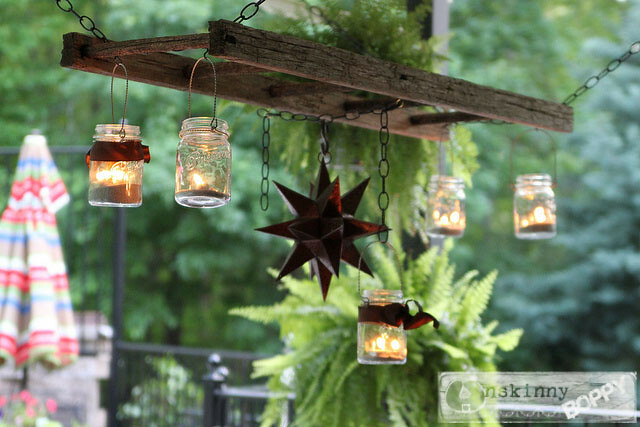 It’s a great way to hang lights, lanterns above the table. So cute! That is just absolutely fantastic! Truly gorgeous and full of charm and warmth. You did such a great job and I like yours TONS better than the PB version…and not just cause of the price difference! LOL! This is awesome! And that chicken crate thingy is screaming to be turned into a coffee table with a piece of glass cut to size on top and casters put on the bottom. I think I saw something like that in a recent issue of Better Homes and Gardens! Thanks for sharing…I am enjoying your blog! Love this so much. You are amazing. Love your blog. I will be following you. Love how you were able to replicate this! I had seen this in their catalog, and always thought what a neat idea it was. I honestly think yours looks way better. That is so crazy awesome that I’m thinking of ways to convince my hubby to take down the ceiling fan in our screened porch space and putting something like this up … or maybe I can find another place. Just love, love, love! After my dad passed away, I scored an old ladder that nobody else wanted. I’ve had it in the garage ever since waiting for that perfect something. This is it! This is that something!! Thanx for sharing!! Awesome photos too!! This is so phonominal…..ok i cant spell….love love this! Awesome I’m sure sitting in your garden must be real treat at night time! I love this!! We just found some great driftwood for a love seat in a slough on the Missouri River–now I want to go get more for a ladderish thing for our sun room. Thanks for the inspiration! I loved this when I left a comment on it in December … and I loved it when I came across it last year before I was even blogging.